Cream of mascarpone to any cake for every taste! Despite the fact that he is quite fat cheese (~ 50%), creams based on it are obtained is not heavy with excellent consistency and taste. "Dilute" usually creams mascarpone cream, eggs, condensed milk, cream, chocolate, fruit purees and syrups. Before moving on to the recipes, Outset several important points: all the ingredients used (whether mascarpone, cream or sour cream) should be the same temperature of the refrigerator. Otherwise the cream can "delaminate". Instead of heavy cream or sour cream can also be used Greek yogurt or soft cheese, but note that their consistency should be thick enough (and the composition of high-quality! ), Or dessert during storage may "leak" or lose shape. Any of the creams according to the recipes below can be stored in the freezer for up to several weeks, shifting in sealed bag or container with a lid. It is very convenient if the cream was left; You can use the next time it previously thawed. Probably the most common variation of the mascarpone :) That is to say, universal cream (for cakes, cupcakes, muffins). vanilla extract - as desired. Let me remind you: the ingredients must be of temperature (from the fridge), except sugar, of course. Whipping cream, add powdered parts to pomp 3-5 minutes (be careful not to overdo it, otherwise the cream can turn into oil and begin to delaminate). Mascarpone mash with a little whisk. Part (not once!) 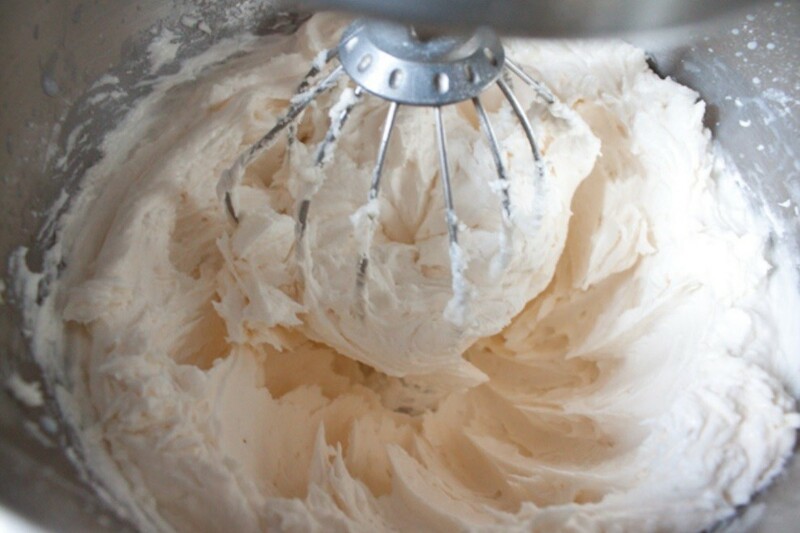 To enter the whipped cream into the cheese (not vice versa) and stir swirl motion (you can whisk or spatula). At first it may seem that the cream "straying" into a ball, but, stir the first couple of tablespoons of cream, the consistency is thick and chewy, and the masses themselves - smooth and supple. Enter portions of cream until the cream will not glossy, and the consistency is quite stable. Work with a mixer I do not advise, the cream can exfoliate. In fact, the cream is used in many desserts, not only in the tiramisu. This basic recipe can be used for cooking and self-goodies (it is enough to put the cream into bowls and garnish with fruit or berries), and as a decoration sponge cakes. Furthermore, the yolks and whites of this recipe brewed. Thus, the cream is safe. water ((for yolks + for proteins, respectively) - 30 25 ml + ml. Yes, if you do not bother about the raw eggs, you can not boil syrup and whisk whites with the sugar and the egg yolks with the sugar in two separate containers (without water, of course). You can use less sugar (the amount in this case is not so essential). Put a saucepan with water and sugar on the fire and cook, stirring, until sugar is dissolved. Beat the egg yolks on high speed until white. Boiling the syrup off the heat and pour a thin stream portions in the yolks, continuing to whisk (minutes 3-5). Mascarpone mash with a whisk, meals enter into the cream cheese egg yolk cream, each time mixing thoroughly until the cream is smooth (no lumps). Put a saucepan with the water and sugar to the fire. Stir, cook it a couple of minutes, bring to a boil (must Uvarov). Start whisking proteins (preferably room temperature). Administered in portions syrup in them, while continuing to whisk, continue 5 minutes (as in the case with the yolks). Protein mass gently shovel (!) To enter into the cream of mascarpone and egg yolks. As a result, the consistency should get a pretty lush. After standing in the refrigerator base for Tiramisu "grab" and become more "stable" and thick. powdered sugar - 150-200 g or to your taste. Cold cream (choose a proven, without acidity and undesirable "grains") Beat with sugar until fluffy (not less than 5 minutes). At first it may seem that the cream becomes thinner, continue beating. Beat the mascarpone or a mixer just 5-10 seconds, then enter the spoon into it whipped cream (not vice versa), and gently stir until smooth and uniform consistency whisk. Cream of mascarpone with condensed milk is convenient because you can cook it in the classic version (with the usual condensed milk) or the tasteful "creme brulee" (with condensed milk). In the second case, you can also add spice in a spoonful of brandy or liqueur cream (to your taste). And preparing it easier - you can do it even without a mixer :)! Corolla (or mixer for 10-15 seconds) a little whisk the mascarpone, then portions introduce condensed milk, stirring well each time aureole. You may need a bit more work to whip cream, but it's worth it: cream turns soft, dense, moderately sweet (sweet controls the amount of condensed milk). This cream keeps excellent shape, has an intense chocolate flavor. Chocolate also contributes to better solidify the cream, so after standing in a refrigerator, it becomes quite dense. Suitable for cakes and to decorate cupcakes, berry Tartu. sugar / powder - 70-100 g or to your taste. Whip cream with sugar until fluffy. Mascarpone mash with a whisk, then enter portions of the cream, mix with a halo. Chocolate break and melt in a water bath or in a microwave oven. A little cool. Pour the melted chocolate into the mass portions of cream and mascarpone, mixing thoroughly each time. Bring the cream to a smooth homogeneous consistency. Another versatile cream of mascarpone, something like a ganache. Excellent freezes, can be used as a standalone dessert. The taste is rich, sweet, perfectly combined with berries and fruit. Berry Tart with this amazing cream, try it! And if you put the cream in the freezer (stirring every 40 minutes), you get a delicious ice cream of mascarpone. Chocolate break into small pieces and add to it some cream (of total amount) and melt in a microwave oven or a water bath. Stir until smooth, cool. Yolks with mascarpone until smooth (if you are afraid of raw egg yolks, then brew them as described in the recipe for tiramisu cream). Beat remaining cream, spatula gently put in a lot of mascarpone and egg yolks (not vice versa! ), Whisk stir until smooth. Pour the melted chocolate into the cream, mix thoroughly. Ready cream cool in the refrigerator (1-2 hours) and used for its intended purpose. PS Looking for recipes suitable creams for cakes? Vanilla, chocolate and not only - all here!